Until now the portal has not published any reviews about Leninist books, although in the mean time your reviewer has read lots of them. The biggest problem is their quality. Roughly a quarter of the Leninist textbooks is stale propaganda, which should never have been printed in these quantities. It is true that about half of the total is tolerable, but yet they are marred by paid lip-services to the Leninist party. Only the remaining quarter is really interesting, also for the western market. Within this last category the book Volkswirtschaftlicher Reproduktionsprozeß und dynamische Modelle by the Leninist economist Eva Müller belongs to the absolute top. The book deserves a translation in English. Incidentally the economy books of Leninist origin suffer from the handicap, that the role of money is played down. To a large extent the Leninist economy is purely physical, and the price formation is even more vague than in capitalism. She originates from the policy of politicians. The cause is found in the choice for the central plan-economy, where the market price is degraded to a supplementary policy instrument1. Thus the Leninist theory is difficult to apply to capitalist economies. Nonetheless for instance the Leninist theory of the intertwined balance has also been applied to West-Germany, as Eva Müller shows in Marxsche Reproduktionstheorie . In the book Volkswirtschaftlicher Reproduktionsprozeß und dynamische Modelle Müller explains in detail which models are available for the optimization of the macro-economic production. Though the book was published already forty years ago, it is still up to date, as far as your reviewer can see. For in the free market economies this discipline is not popular, so that it stagnates. The matter is a mixture of input-output models in the style of the Russian economist Vassily V. Leontief, of Keynesian growth models, and of linear programming. The books is divided into two parts. The first part discusses all quantities, which are relevant for the social (macro) production process. The second part explains clearly the principles of the dynamic production models, and gives step-by-step derivations of the used mathematical formulas. The models are abundantly illustrated with examples. Müller is not just an experienced economist, she also excels as a teacher. Incidentally her arguments are profound to such an extent, that no room is left for the description of case studies. Yet most of the models have actually been applied by policy institutes of the Leninist planning system. It has really been attempted to accurately determine all material flows, including the exchanges between the various branches. Moreover the so-called multi-year plans have been computed with them. This requires obviously an accurate knowledge of all production processes. Therefore in the first part of the book the definition of all sorts of material constants is elaborated in depth. They concern the use of labour, of raw materials, and of equipment. Moreover the social consumption is modelled. Also the foreign trade can be included in the models. The text confronts the western reader with typical Leninist terminology. For instance the equipment is not called the stock of capital- or investment-goods, but instead the name fundamental fund is used. Incidentally the word "fund" is a common term in Leninism, in all cases where stocks or supplies are present. And where for instance Leontief refers to the production coefficients, there Müller calls them material consumption coefficients (in the German language Material-aufwand). There may be ideological reasons for this, because the Leninist party likes to show off with her "own" science. Moreover there is the habit to copy terms from the theory of the revered Karl Marx, for instance production circulation fund instead of simply "raw materials". Thus the first part of the book discusses in essence the book-keeping of the production process, which to be honest is not a stirring subject. However, it is a necessary preparation for the second part, which does present a stirring content. The second part starts with (there is no other choice) the reproduction scheme of Karl Marx. The find of Marx is indeed the historical foundation for the theory of the intertwined balances, at least if the tableau économique by François Quesnay and the physiocrats is ignored. Moreover Marx analyses here the conditions for a stable growth path, with constant coefficients. Müller adds a calculation by Vladimir I. Uljanov (alias Lenin), but that is mainly an ideological bow of the knee2. After this historical homage Müller treats the so-called dynamical one-sector models. In fact these are Keynesian models, that show how investments influence the economic growth. It characterizes her approach that difference equations are employed, so that the real developments in time can be computed in a numerical manner. In other words, the model allows for empirical quantities. Also the other models turn out to use explicitely the statistical data. In this regard there is a difference with similar models in capitalism, which mainly aim to give a qualitative explanation. The remainder of the book is devoted to the dynamic multi-sector models. Its simplest version is the fundamental model of the intertwined balance. This model assumes a simple investment equation. By way of exception Müller discusses here also the differential equation, in addition to the difference equations. In the first case an analytical solution exists for the end product. Since this model is too restricted for practical applications, she quickly moves on to the intertwined balance with an extended investment equation. In this model the investment behaviour has a closer resemblance to reality. The reader may note, thay similar multi-sector models are scarce in the western text books3. An original find is the dynamic model with steering parameters, which describes an economy with three sectors. It is invented by the East-German economist Bärbel Biersack. However, the definite work is the fundamental model of a multi-period optimization. Here the method of linear programming is introduced. Whereas the preceding models are intended only for computations of the consequences of the policy plan, this model disposes of its own target function. That is to say, not the policy measures are the starting point, but the policy goals. Subsequently the program searches by itself for the optimal package of measures. Thus Müller has in a smart way built up a scientific climax. Note that in essence this model describes material flows, just like all other discussed models. Nevertheless, the target function does contain weighing factors, which indicate the value attached by the policy makers to the various end products. Incidentally, the linear programming supplies the shadow prices of the products4. It is worth mentioning, that Müller also discusses a production model, which originates from the famous German-American economist John von Neumann. This model contains both a material balance and a price balance. It is clear that the Leninist economists have achieved their greatest successes in the development of the intertwined and optimization models, which were sorely needed due to the mediocre results of the planning practice. Müller describes in the book Marxsche Reproduktionstheorie, how the Leninist elite had hopes of a break-through by means of these models. Unfortunately this did not happen. But even though the models can not capture the reality, they do provide an insight into the general development of the real production processes. And that is quite useful. 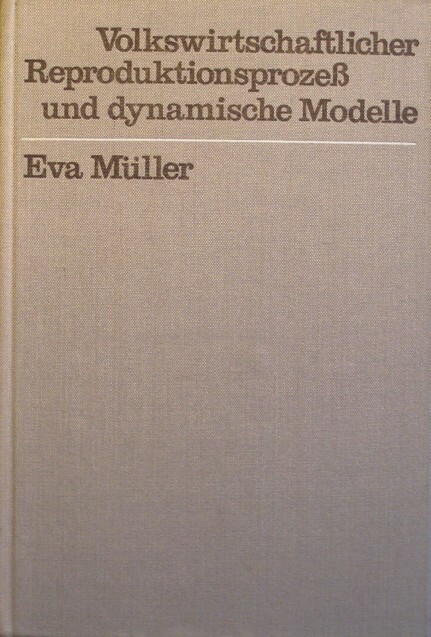 In summary, Eva Müller has written a fascinating book with Volkswirtschaftlicher Reproduktionsprozeß und dynamische Modelle. It discusses matter, which can not be found in western textbooks. Somewhat affiliated are the books about operations research, but those are limited to the micro level in the enterprises, and must follow the market prices. The models of Müller deserve to be remembered, for they have the potential to describe the macro level. Those who are interested in computations of the macro-economic policy plans, may well consider to add the work of Müller to their bookcase. Fortunately it is still payable at a fair price on the second-hand market.